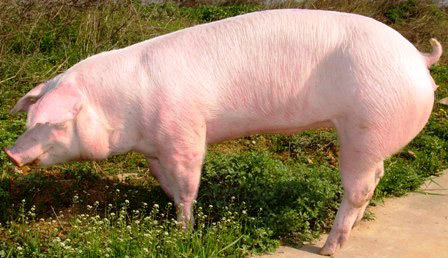 Danish Landrace pigs are a medium to large white breed of pig. They have long bodies, fine hair, long snouts, and heavy drooping ears. There are two distinct varieties, the white and the piebald. The first registered Landrace herd was established in 1896 in Denmark, with the first progeny and sibling tests in 1907. Since then, production and quality testing have become a regular part of the Danish swine improvement program. Primarily because of this breed, Denmark had become the world's chief bacon-exporting country and for many years refused to export purebred Landrace breeding stock to protect this position. Registrations are governed by Denmarks Landsudvalget for Svineavl og Production (National Committee for Breeding and Production). Danish Landrace pigs have been exported to the United States, Canada, Brazil, Chile, Mexico, Japan, Taiwan, People's Republic of China, Philippines, Malaysia, Sweden, Thailand, the former U.S.S.R., Albania, Hungary, Greece, Germany, and several African countries.